Make sure you review our Main Formatting Page regarding bleed and basic template use! And then see the special notes for your item below as well as the templates. Once again we suggest at least 2mm of bleed. 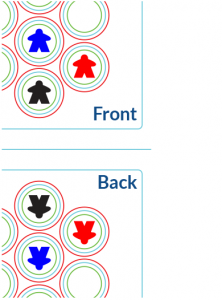 The back side folds over on the line so what is right-side-up on the front needs to be upside-down on the back. 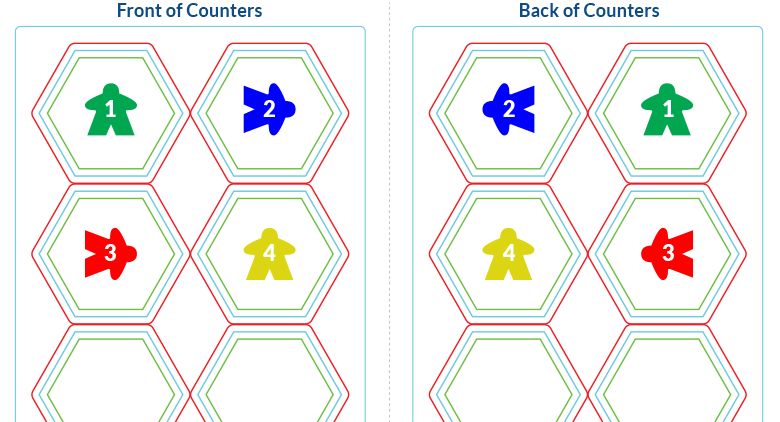 Our larger tokens need to be on two different sheets, front and back. Some times the front and back are different files, depending on the file. These are top mirror aligned like double sided cards. Take careful note of where the back tiles line up. White is our safe color. All images or text within the white area will be safe and preserved to your final product. Black is our cut line. This is the intended border or edge of your card, counter, board, etc. 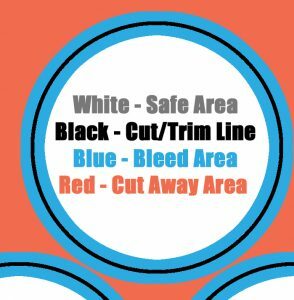 Blue is suggested bleed. Anything in the blue may or may not end up in the final product. Red is the cut away area. Anything in the red will not be in the final product. Make sure to remove all of these layers, Especially the cut lines before uploading! ALL of the templates will specify how you need to export the files to upload successfully to the website. We provide many file types for ease of design, but we may not accept all of those types. Exporting exactly as the template says will ensure your game looks like it looks on your screen!